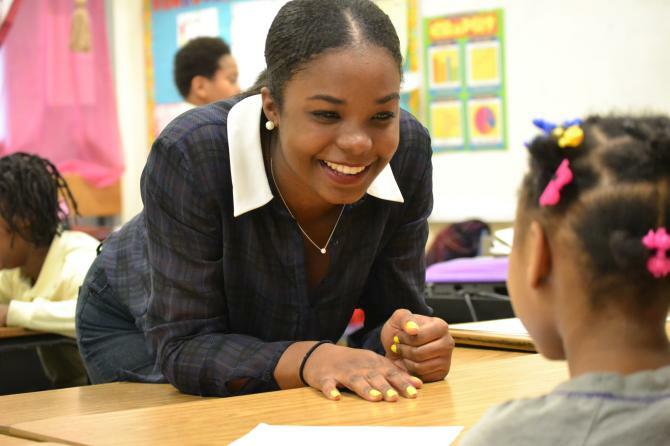 Howard students work with elementary school and high school students in their Detroit classrooms. A jeep driven by Chelsea Gaddis loops around Euclid Street and back onto 16th Street in Northwest Washington, D.C., around 10 p.m. She laughs and chats with three young men piled in the back of her jeep, as she drives. Gaddis, a graduating senior at Howard University, is also the sight coordinator for the university’s 2014 Alternative Spring Break (ASB) trip to Detroit. The young men in her jeep, Randall Parham, Aman Johnson and Theodore Lee, are just three of 43 student participants on the trip. According Howard University’s ASB 2014 website, Detroit is just one of seven locations students were sent to this year to complete service projects focusing on issues that plague communities within each location. Participants traveling to Detroit during their spring break focused on improving the literacy rates of elementary and high school students. Other locations focused on gun and gang violence, poverty and health education. The ASB program has been run through Howard University’s Rankin Chapel for 20 years. On this 20-year anniversary, nearly 400 volunteers descended upon various cities, giving a combined 16,000 hours of service. The students placed in Detroit were inspired to participate by a various reasons that led them to forego a trip home or tanning on a beach somewhere. Freshman Spanish major Monica Johnson, on the other hand, had intentions to participate in ASB before she attended Howard. Gaddis, a Detroit native, participated in ASB since she was a freshman. She went to Chicago in her freshmen and sophomore years and in her junior year, she stayed in Washington, D.C., to act as database manager for the entire service project. When Gaddis applied to become a site coordinator in her senior year, she focused on the Detroit location because of its service mission. Preparation for a service project of this size proved itself to be an enormous task. Not only were site coordinators expected to set up an itinerary each day, but they also had to find sponsors, housing and some form of entertainments for their participants. “I think the scariest part wasn’t all the planning,” Gaddis explains. “I think the scariest part was the unknown. I can’t prepare for every weird thing that happens on this trip- and trust me. Weird things happen. Participants, while preparing for departure, were also nervous about some of the issues they might face on the trip. Many volunteers were worried about their interactions with the high school students. Carr asked the volunteers what they considered to be problems that exacerbate illiteracy in Detroit. Participants cited students struggling with reading comprehension, an impatient school system and getting little to no reiteration of what they are learning in classrooms at home. After the discussion, students boarded the bus, preparing themselves for a 9-12 hour drive to Detroit Mercy University, which offered dorms as housing for volunteers. During their week of service, participants ate breakfast at 7 a.m. and boarded a bus no later than 8 a.m.. The participants split into three groups. Two groups visited Coleman A. Young Elementary School, near the heart of Detroit, in the morning. Then the two groups split up in the afternoon. One group went to Osborn College Preparatory Academy, and the other went to an adult education center to work with people over 18 years old. The third group of volunteers went to Cody High School in the morning and Christ Child House Orphanage in the afternoon. At the elementary schools, participants visited kindergarten to fifth grade classrooms and carried out lesson plans for the students. At the high schools, participants worked with students on college preparation. After their trips to the high schools, elementary school and orphanages, volunteers visited shelters around Detroit, including Detroit Rescue Mission and Oasis Soup Kitchen. Various groups fed the participants, including the Howard University Alumni Association Detroit Chapter, Hope Missionary Baptist Church and the Alpha Phi Alpha Inc. Alumni Detroit Chapter. These groups, along with others, provided participants with various perks, including a tour of the Chrysler Building and tickets to a Detroit Pistons game. With the exception of one unplanned snow day that shut down public schools, most activities and school visits went as planned. Despite a week full of activities outside of the classroom, what seemed to impact many students the most was their interaction with the students. Other students were impacted by the physical and emotional state of Detroit. Gaddis agrees that some students in the Detroit school system are falling through the cracks. In spite of the painful discoveries made on the trip, volunteers were able to find positive messages in their service. Others found that what they experienced during their time in Detroit changed their way of thinking. Gaddis experienced many of the same stories her volunteers discuss during her two years of service in Chicago. It was the change from a volunteer role to a leadership role that impacted her the most this time. On March 14, the evening of the volunteers’ departure back to Washington, D.C., Gaddis stood in front of her volunteers in one of Detroit Mercy University’s dorm lounges. The room erupted in laughter once again and when it quieted down, she continued.